You are currently browsing the The Pet Product Guru blog archives for the day Monday, January 21st, 2019. Just like your car can act as an oven in the summer, it can act as a fridge in the winter locking in the cold temperatures. If you leave your dog in the car on cold days, he can get hypothermia. Just like in the summer, your dog can suffocate in the car no matter what the temperature is. And if you leave water in your car for you dog when he gets thirsty, just think about if the water freezes in the winter. Your dog will be cold, suffocated, and have nothing to drink. In the worst case, if left in the car in the winter or in cold weather, your dog can actually freeze to death. When taking your best friend for a walk, make sure it’s a very short one and that he’s properly covered. If he has an accident in the house, don’t yell at him, after all would you be able to go outside in sub zero temperatures? If you have a fenced in yard, you can let him out very briefly several times during the day to do his business. 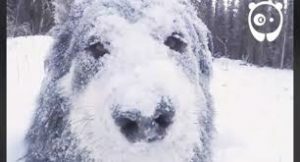 Take some simple common sense steps to protect your dog in this brutally cold weather! Stay warm and keep the oldies playing all day on Edgewater Gold Radio! Download the free Edgewater Gold Radio app or listen from our website: Edgewatergoldradio.com.